This past Monday, Amish at Ethridge, Tennessee were victims of a pair of armed robberies. In both cases a truck was used to block the road, and an armed individual emerged to demand money. The assailants even shot at one Amish buggy as it fled. The good news is that authorities have captured three suspects. It sounds like, for their trouble and likely impending prison sentences, the trio acquired a grand total of $100 from their victims. As we discussed in “Why do Criminals Target the Amish?” the Amish may appear to be attractive victims for a certain kind of criminal. 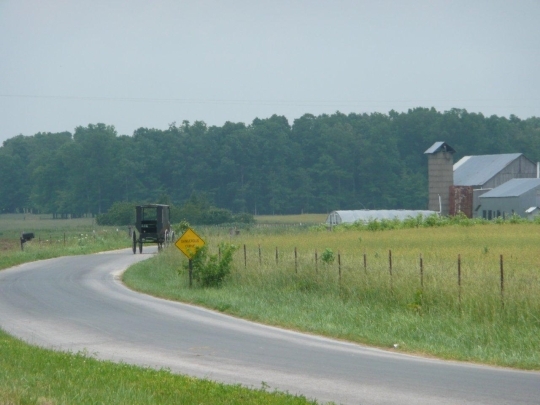 One part of the attraction is that Amish are in slow-moving vehicles, so can’t speed away when threatened. The attackers may also be aware of the Amish policy of non-resistance, which precludes using force against wrongdoers. So the Amish in a sense are really coward’s targets. This does not mean Amish won’t alert police, however. It’s unclear how much Amish cooperated in this case (some Amish involvement with police to stop crime can go surprisingly deep) but no doubt the police had to be made aware of what was happening. Sadly this isn’t the first time the Amish at Ethridge have been targeted; something similar happened three years ago in this community. Nice job by the Lawrence County authorities to bring these people in. My father had Amish work for him off and on over many years and now that I am back to the family farm, I also have contracted with the Amish to help us out. I had a long discussion last December with Isaac, one of the elders in our local community, about the non-violent non-aggressive attitude towards criminals. My emphasis was on the coming riots that will happen here in America with the malcontents spreading out from major cities to cause harm to anyone and anything. Don’t let their non-violent ways fool you. They are well aware and well prepared to defend their families, especially their women. They won’t say much about this, like a lot of other things they won’t say much about, but just don’t be fooled. Agree with Mark below, this sounds a little far-fetched and fantastical. One of the most important histories in Amish society is that of Jacob Hochstetler, an 18th-century example of non-resistance. I have not seen much evidence of Amish getting involved in riots or anything like that. Nor have I ever had any sense I am “being fooled” by my Amish contacts and friends over the years. Individuals are individuals but with most things in life I think “what you see is what you get” usually applies pretty well. I’d have to agree. This sounds a little out of order to me. I have never heard of anything like this. Never. That attitude would go directly against the 18 Articles of Faith as stated in the Dordrecht Confession of Faith used by the Amish. PS — Very odd, the Amish ministers’ directory does not list any “Isaacs” in any of the MO communities, are you sure he is ordained?